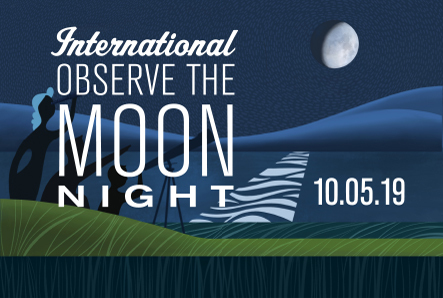 International Observe the Moon Night a Success! International Observe the Moon Night, on Spetember 18th 2010, was a global skywatching event to spur public interest in the moon with almost 400 venues scheduled in 30 different countries. With the International Observe the Moon Night at NASA Ames Research Center, NASA was once again reaching out to the public, showing how our latest lunar exploration is changing our view of the Moon and how the public can become active participants in this exploration. The NLSI is grateful to the over 25 amateur astronomers who remained undeterred by the weather forecast and set up telescopes for public viewing. The night was wonderful, and the sky was clear the entire time! As darkness fell at Ames, skywatchers lined up at the telescopes, forming lines that in some cases were 40 people deep. There were between 600 and 700 people in attendance with lots of families with kids from all ages. The 3 year olds were looking through the scopes just as the adults were. Those eager for some harder science listened to researchers discuss recent discoveries about the moon. The speakers were David Morrison, former director of NASA’s Lunar Science Institute; Barry Blumberg, a Nobel laureate and former director of the NASA Astrobiology Institute; and Greg Delory, deputy project scientist of the LADEE mission. The FINESSE volcanic research team’s first phase of a five-year project at Craters of the Moon is paving the way for future human and robotic exploration.